Another excellent clumping bamboo that settles into a clump around 1.5 in diameter. Very tight clumps and the name comes from the where it was originally grown in Thailand and surrounding areas where it was grown in Monasteries. Very upright and will reach 10m, an excellent screen to tight spaces. A very clean bamboo for the lower 2/3rd and it also seems to manage to keep a tight crown. Its dense habit makes it a great screening plant and wind barrier. The shoots are edible, but difficult to get to. 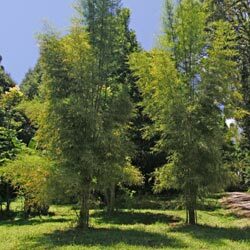 Monastery Bamboo will grow in full sun to part shade, and as with all bamboos we suggest that you use a root barrier if you wish to constrain growth. Fertilize in spring with an all purpose fertilizer.